Bacteria target medicine to shrivel mouse tumours. 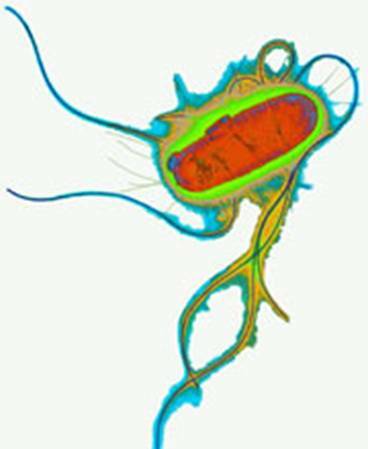 E. Coli carry a key protein deep inside the cancer cells. Genetically engineered bacteria could help fight cancer. In mice at least, modified bugs have been used to prime tumour cells to respond to anti-cancer drugs, killing the cells and shrinking tumours. Georges Vassaux from the Hammersmith Hospital, London, and his colleagues injected mouse tumours with an altered form of Escherichia coli, a bacterium that sometimes causes food poisoning. The DNA in the bacteria was modified to allow them to enter cells. The mice were then injected with cancer drug 6-MPDR. This drug is inactive and has no effect on its own, but one of the bacteria's naturally occurring enzymes turns the medicine into a potent toxin. The treatment killed cancer cells in the area where the drug had been activated and left surrounding tissue unharmed. Three weeks later the tumours had shrunk by up to two-thirds and most of the remaining cells were dead, the team report in Gene Therapy1. Such a targeted effect is an improvement on standard chemotherapy treatments, which can damage healthy as well as cancerous tissue, says Vassaux. Although human trials are a long way off, the technique looks most promising for isolated cancers that have not spread, such as head and neck tumours. The method could be used to reduce tumours before surgery; it might also prevent their recurrence. "We think that introducing bacteria into a patient's body, albeit harmless, neutered ones, will provoke the immune system and help to direct it against the tumour," says Vassaux. This could prime the body to destroy any cancerous cells left behind by surgery and prevent secondary tumours from forming. The team added two new genes to their E. coli bacteria. One, called inv, makes a protein that helps the bacteria penetrate human cells. The second, hly, helps the bugs spill their contents, releasing the drug-activating enzyme. "It is an interesting idea," says Nigel Minton from Nottingham University, UK, who studies the anti-cancer potential of bacteria. But he points out that other groups, including his own, are attempting to get similar results without the need for genetic modification. Spore-forming bacteria, such as the food-poisoning culprit Clostridium, could also be used to deliver the critical enzyme to tumours, he says. If the spores are injected they disperse around the body and germinate in oxygen-poor areas, such as tumours, releasing the enzyme. When the inactive cancer drug is added, it is kicked into action and mouse tumours shrink. In this case, the bacteria do not enter the actual tumour cells, but they release their contents nearby. Using bacteria to target cancer cells is an innovative tactic, says Robert Souhami, director of clinical research at Cancer Research UK in London. "Developing new drugs tends to grab the headlines, but equally important is the development of efficient systems to deliver treatments to cancer cells."